When sailing in SL your SL viewer plays a vital role as a means to control the ship and your navigation. In no particular order I discuss here a number of aspects which in my opinion should be considered. I have only good experience with the Firestorm viewer and very little with the original LL one which I consider suitable for beginners and not so much for sailors..
HUDS are a popular way to integrate control from the avatar with the rest of SL. Boats are no exception, so many designers use HUDS to control their boat. Advantages are clear, since you can simply push a few buttons to activate stuff. Disadvantages are you always need to have the HUD on, which is an extra action you need to take before you can sail. Some builders even require you to wear the hud before you can rezz the boat. A HUD also takes away real estate from your screen and it adds to your script weight. An alternative way to control your boat is using chat commands. 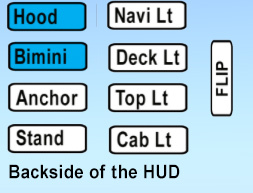 No HUD needed, but you need to memorize the commands and find time to type them while you are sailing. In my mind chat commands are for this reason not a very good option. Boats like the bandits IF and 60 have way too many chat commands and therefore a good HUD is a better solution. Rumour says that using so called gestures, which is basically a key-command to initiate a more complex key-command, is faster than a HUD. My boat designer sources told me that this is not true. Also my own testing never proved any significant difference between a hud and gestures. So, I stick to HUDS and ASWD keys…. Sailing means crossing regions or sims (simulators) as they are often called. Every time you cross into another region the server of that new region needs to mount all the scripts that are attached to you, the boat and your on-board friends. So the more scripts, the more work, the more chances things go wrong. Look at your minimap to see when you are nearing a region border. The transfer from one server to another shows often when a boat is seemingly crossing a region border and then suddenly is pulled back, often with a burst of wake particles (foam). That is because your viewer conveniently assumes you still moving in the same direction and speed, so it projects that assumption on your screen (its called rubber banding). But in reality your boat is stuck on the region border, waiting until all the script transfer from server to server is done. If it takes too long or fails, you slowly sail or fly away into never-never-land, and re-log is the only option left. So to minimize crashes its pays to wear as few scripts as possible, and of course buy a boat that is optimized for sim crossings. Note: this sim crossing problem is NOT the same as lag, although lag can also have a negative effect on sailing. During sailing lag is usually not an issue since there are few textures to download and few avatars around. 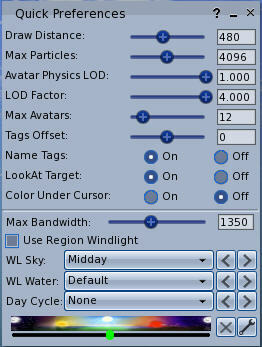 TIP: Animation Overiders (AO) use lots of scripts. Firestorm has a built in animation controller. You can transfer your AO content to the viewer inventory and remove the commercial AO controller which saves you 16-20 scripts. Procedure is explained if you open the AO help screen in FS. TIP: If you invite a friend aboard for a trip, make sure his or her scripts are as low as possible. Ask them to detach HUDS etc. You can check their script load by Right click>Script Info. If you do this the chances of crashing on sim crossings are much diminished. TIP: try to avoid crossing regions on the corners since it means you are dealing with 4 regions almost at the same time and that is a sure way to crash. So look at the map and try to cross in the middle of a region, not near the corners. We discussed the importance of maps elsewhere. Setting the minimap correctly is important and even more important is to keep an eye on it when sailing to see where you are heading, sim crossings and if others are nearby..
You can set your own sky and water in the viewer, which is very nice. If you like to make a night trip with your boat you can, but of course you don’t see as much. Same is true for water. If your setting permits water reflections, then its more difficult to see the edges of water/land and you can run into the ground. Also the settings of your screen can have great influence. Higher gamma can help darker, older screen to display lighter. Not all regions have auto-return switched on. Auto-return means that abandoned prims of non group visitors will be automatically returned to them after a certain number of minutes. This number is set by the land owner in the objects tab of the land. If it says 0, then auto-return is off and prims will never be returned. Why is this important to sailors? 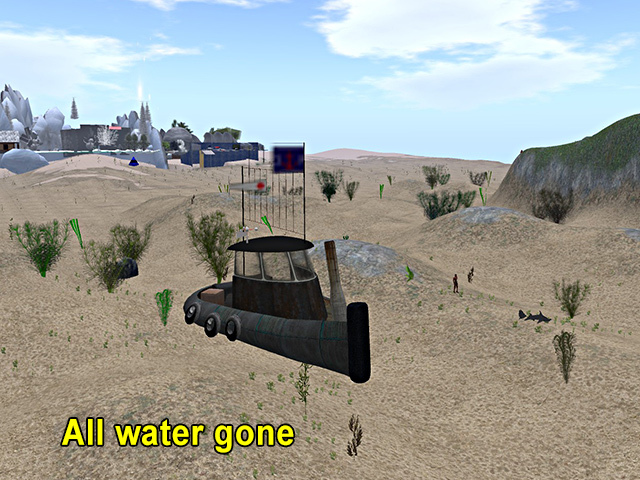 Well, if prims are left behind in the water and you sail into it, your boat stops. No matter how small the prim, its like you hit a wall. So if you suddenly stopped dead in the water, look for a prim. Often these prims are transparent, so switch on transparency ALT-CTRL-T and also switch the water off to see it better. You can easily check if that prim is phantom or not (Edit>Object>Phantom). If it is phantom, then you would normally go straight through, but it is not phantom right? You may have discovered Draw distance in the graphics settings of your viewer. Too little and you see stuff too late, too much and you may suffer local lag. So try to optimize depending on your location, hardware and speed. TIP: the Firestorm viewer has a draw distance slider in quick preferences. It happens sometimes when you sail close to the edges of a house parcel that you receive a message from a security device, telling you to go away or else…Security devices should be configured in such a way that they only scan to the edge of the parcel and not beyond. In sailing estates most owners often have strict rules on security settings or don’t permit them at all. So if you feel the device is setting too loose, then warn the owner of the place about it and ask in a friendly tone to look at it. Most owners are not even aware of it, since they never receive a warning from their own devices. lag is one of the most annoying problems in SL, I am sure you aware of that. But when sailing its even more of a problem because it can lead to crashes. Good practice is to stay away from sims with lots of builds and avatars. Especially when sailing in Blake sea you have the option to stay in the Linden regions and avoid airfields and other crappy places. Mini map tells you if there are many builds or people, so that is a good indicator. If you cannot avoid it, then lower your boat speed, region servers love slow moving avatars. Don’t confuse lag with sim crossing problems, they are very different beasts. If you crash and loose your boat or plane then usually its send back by some or other parcel with auto return on. But it can take a long time if its off and the owner is not in world for some time. You may get a message from a ‘SL Coast Guard’. 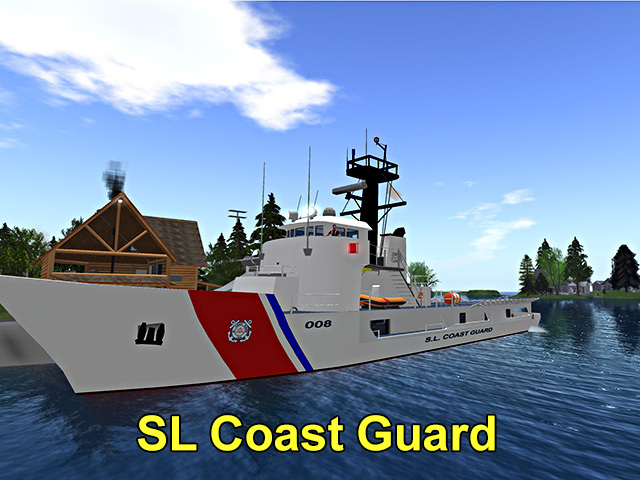 These people sail and fly around in boats with SL Coast Guard text on it looking for trouble in and on the water. They are good at spotting abandoned boats. Once a boat of mine was stranded INSIDE a house, but that did not fool the coast guard. Best practice is of course if you make the effort to retrieve your crashed boat yourself. I always do, or at least I try to. Coast Guard girls wear shiny uniforms with short skirts look very erm… professional. When sailing with a friend, talking in IM is difficult because it takes time and effort to click the IM box. Better solution is to use open chat. To start a new chat line while sailing, all you have to do is hit enter and start typing, so no mouse aiming is needed.